I’m a cookbook junkie. I have shelves and shelves of cookbooks of all different types. I seriously love them. I honestly love just having them – I don’t cook a lot from them. In fact, most of my cookbooks get looked at once, maybe twice a year. As always, there are exceptions. Baked: New Frontiers in Baking is my most recent purchase and I’m obsessed with it. Every single dish I’ve made from it has been amazing. If you don’t own this book, I beg you – BUY IT! 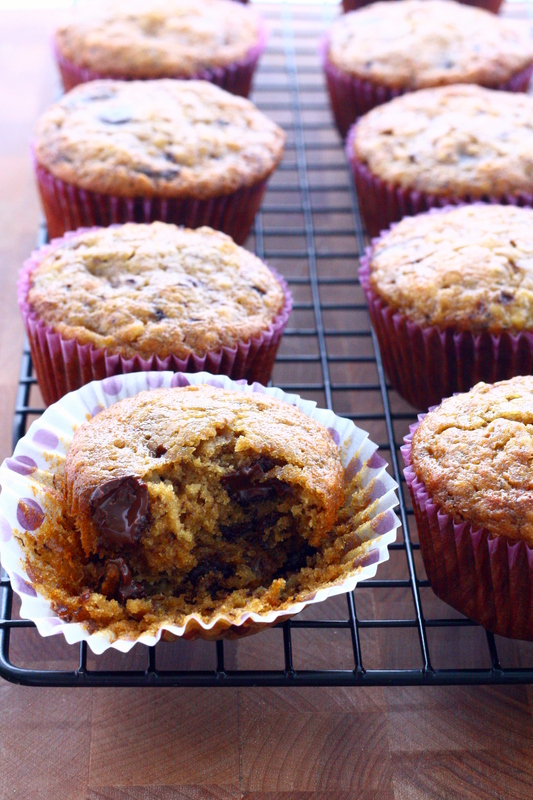 Now, these muffins… so so good. In fact, I made these about 2 months ago for some friends. They were gobbled up before I even got a chance to take a photo for the blog. 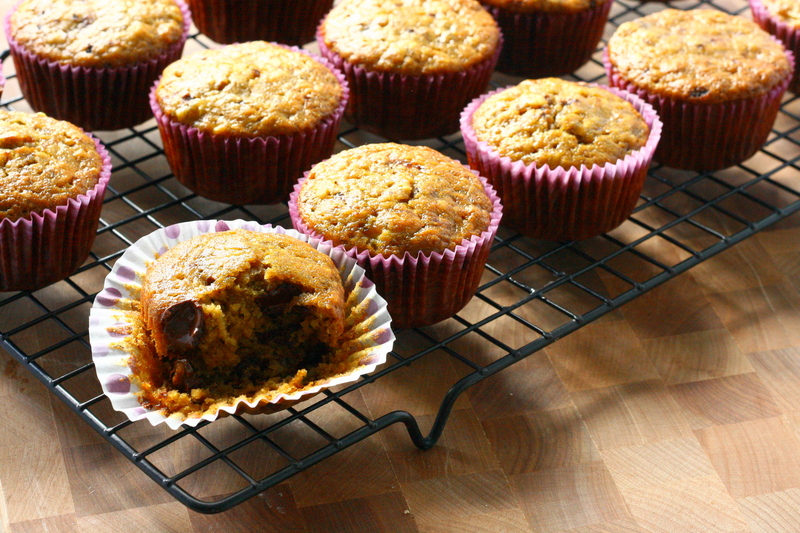 Thankfully, these muffins are also very easy to make and really tasty so I didn’t mind having to make these again! In fact, I whipped these up before heading to work on Friday. It only took about 20 minutes of prep time and another 20 for baking. I made a few adjustments so they would be a bit healthier and I loved how they turned out! Preheat oven to 350°F. Line 2-12 cup muffin pans with liners or grease with nonstick spray. In a medium bowl, stir together bananas, sugar, brown sugar, butter, applesauce, milk, and eggs. In a large bowl, whisk together flour, instant coffee, baking soda, and salt. Make a well in the middle of the dry ingredients and slowly pour in wet ingredients. Stir until just combined. Fold in chocolate chips. Fill prepared muffin cups with batter, filling each one 3/4 full. Bake for 20 – 25 minutes, or until a toothpick inserted into the center comes out clean. Let cool in pan for 10 minutes before removing the muffins and placing on a cooling rack to cool completely. Categories: Bread, Muffins & Rolls, Breakfast & Brunch, Chocolate | Tags: breakfast, chocolate, fruit, muffins, quick and easy | Permalink. i nominated you for the beautiful blogger award, enjoy. I have had that book on my list of cookbooks to buy since I saw it on The Amateur Gourmet’s blog for the Oatmeal Cherry Nut Cookies with cardamom from the book. Those cookies are AMAZING! These muffins look awesome too.